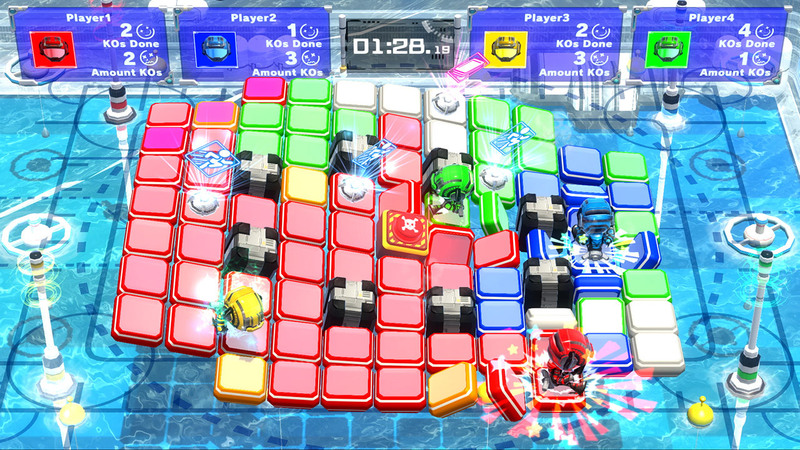 Flip Wars – This tense multiplayer action game will have you stomping to flip over panels—and unwitting opponents. To win, flip the most panels to your color in local battles*, online** or single-player. The more you flip, the faster you’ll move in a mad dash to nab power ups. Increase your flip range, turn invincible, and more across three modes and 12 arenas. Sonic Mania – 2D Sonic is back in a new adventure. In a celebration of past and future, play as Sonic, Tails and Knuckles as you race through new Zones and fully re-imagined classics, each filled with exciting surprises and powerful bosses. Go head-to-head with players in Competition Mode or play in Co-Op Mode with a friend. Welcome to the next level for the world’s fastest blue hedgehog. Sonic Mania will be available on Aug. 15. Severed – From the creators of the Guacamelee! game and inspired by classic dungeon crawlers, Severed puts players in the role of a one-armed warrior named Sasha who wields a living sword on her journey through a nightmarish world in search of her family. MONSTER HUNTER STORIES (Demo Version) – Venture into monster nests to collect eggs and hatch a wide array of species with uniquely powerful skills. Form teams, battle alongside them, crush opponents with combo attacks and ride into the sunset a champion. Need more muscle? Then mix and match genes to create monsters with more abilities. Fire Emblem Heroes – Fans of the mobile game will see a flurry of activity this week. Starter Support Events: Beginner and veteran Summoners alike will have a chance to strengthen their armies. During this event, they can summon five-star versions of four popular Heroes, and enjoy special log-in bonuses. 1. Hero Fest: 12 a.m. PT Aug. 10 to 11:59 p.m. PT Aug. 17 at: Here comes a Starter Support Hero Fest to help out new Summoners. It features some great Heroes at a boosted starting appearance rate of 5 percent. Starter Support Log-In Bonus: Receive 20 Orbs if you log-in between now and 11:59 p.m. Aug. 24. Six-Month Anniversary Celebration Log-In Bonus Part 1: Receive 20 Orbs if you log-in now through 11:59 p.m. PT Aug. 21. Six-Month Anniversary Celebration Log-In Bonus Part 2: Receive 20 Orbs if you log-in between 12 a.m. PT Aug. 22 and 11:59 p.m. PT Sept. 10. New mode: Arena Assault: In this mode, you’ll need to use a different team of Heroes in each map for a real challenge. New feature: Catalog of Heroes: Check out all the Heroes you’ve met so far. Plus, the Max Hero Merit limit has been raised from 2,000 to 3,000+. New updates: Tempest Trials Get Powered Up: The event runs 12 a.m. PT Aug. 11 until 11:59 p.m. PT Aug. 24. Auto-Battle will automatically continue until you clear all maps or your team is defeated. Team Management for Multi-Map Battles: You’ll be able to create up to 10 reserve teams. New Stage with level 10 foes. Score Bonus: Each day, you’ll get triple the points the first two times you head into battle. Stat Boost for Bonus Allies: When you use Bonus Allies in Tempest Trials, they’ll get a 10-point boost to HP and a four-point boost to all of their other stats. They also will earn double experience and SP. **Nintendo Account required. Online services and features, including online gameplay, are free until the paid Nintendo Switch Online Service launches in 2018.